Ghazala Hashmi is seeking the Democratic nomination for the 10th State Senate District in 2019. 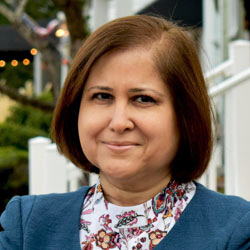 Dr. Ghazala Hashmi has spent over 25 years working within Virginia's colleges and universities. She currently serves as founding Director of the Center for Excellence in Teaching & Learning (CETL) at Reynolds Community College. Ghazala and her husband have lived in Chesterfield County for almost 30 years, and their two daughters are graduates of Chesterfield County Public Schools. She is a board member of the Virginia Center for Inclusive Communities (VCIC). Learn more about this issues on Ghazala's web page.